The early 2000s represented a period of stability in the demand for Proof Gold American Eagles. Though gold prices were on the rise, many gold buyers were seeking out the bullion version of the Gold Eagle, including collectors. 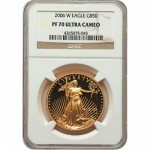 The 2001 1 oz Proof Gold American Eagle Coin is currently available to you for purchase online at Silver.com in perfect condition. 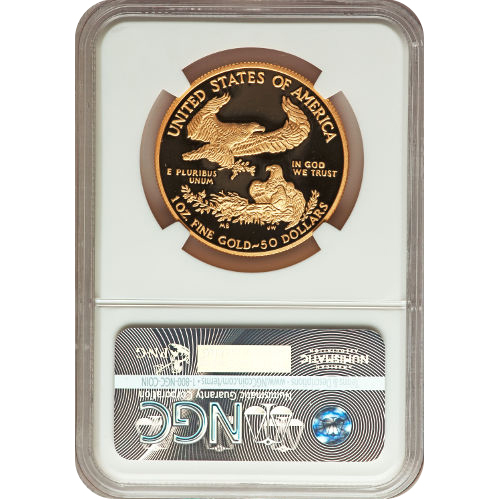 Coins ship to you housed in NGC protective plastic slabs! 15th anniversary year for the Gold American Eagle collection! Availability limited within the original 24,555-coin mintage! Lady Liberty on the obverse of the coin. American bald eagles on the reverse of the coins. Both the bullion and proof versions of the Gold American Eagle slipped in 2001. The bullion coins had seen record highs in from 1998 to 2000 amidst the concern over Y2K and growing economic uncertainty as the Dotcom bubble burst on Wall Street. The Proof Gold Eagles initially benefited in 1999 and 2000, but by 2001 interest had cooled. 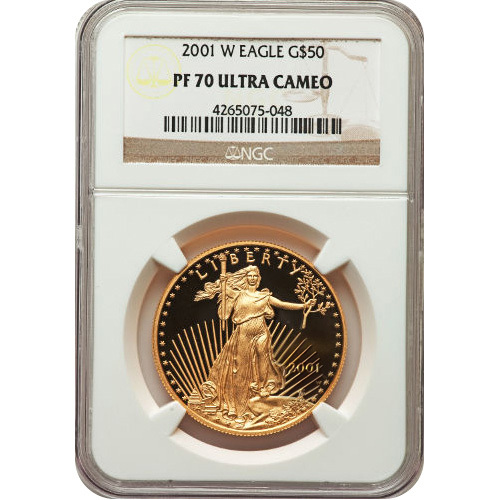 The 2001 1 oz Proof Gold American Eagle coin fell by some 8,500 coins in total mintage from the previous year and set a level that stands to this day among the lowest in the history of the 1 oz Proof Gold Eagle. In fact, the 2001 mintage ranks second-lowest only to the 2012 coin. On the obverse of the 2001 1 oz Proof Gold American Eagle is the iconic vision of Liberty created by Augustus Saint-Gaudens. Developed in 1907, this design was the result of President Theodore Roosevelt’s drive to revitalize the appearance of all American currency in the early 20th century. The reverse side of the 2001 Proof Gold American Eagle includes Miley Busiek’s depiction of bald eagles. This design was created in 1986 strictly for the Gold American Eagle’s release and is not used on any other coins from the United States Mint. These 2001 1 oz Proof Gold American Eagle coins earned PF70 certification from the NGC. Coins in this condition have full, original mint luster with no detracting flaws present. The UCAM designation is reserved for proof coins with strong, frosted matte elements on the design sets and deeply-mirrored, clear background fields. We encourage Silver.com customers to contact us with questions at 888-989-7223. You can also reach out to us online through our live chat and email features.